Tonight Alive have announced they have signed with Hopeless Records. To celebrate the news, the band have released a brand new song titled "World Away," that can be streamed below. 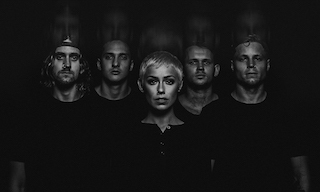 ""World Away" is a continuation of our quest for self understanding and empowerment, but this time through developing a personal relationship with darkness," vocalist Jenna McDougall says. "In a society that conditions us to suppress and shy away from confronting emotions, we wrote an invitation in "World Away" to shake hands with what scares us most and begin recognizing the opportunity for growth in struggle. Produced by Dave Petrovic (The Other Side, The Edge) we are sharing "World Away" with our fans as the introduction to the sound of the next chapter of Tonight Alive." Tonight Alive will enter the studio this summer to start recording their next album.